The radish and mint in this salad really give it a sense of freshness. I like the simplicity of cos or iceberg lettuce, which makes everything else in the salad jump. 1. Wash and dry the lettuce and leave in the fridge to keep cool. Pick the mint leaves and roughly chop. Set aside in a small bowl. 2. To make the dressing, whisk together the olive oil, vinegar and honey in a small bowl. Set aside. 3. Remove the radish tops and slice radishes in half. Place half of the radishes in a mortar and pestle and gently crush. Repeat with the remaining radishes and place all the radish in a small bowl. When you wish to serve the salad, dress the radish with a tablespoon of the dressing and season with a pinch of salt. 4. Combine the leaves and chopped mint in a serving bowl with the rest of the salad dressing. Toss to dress. 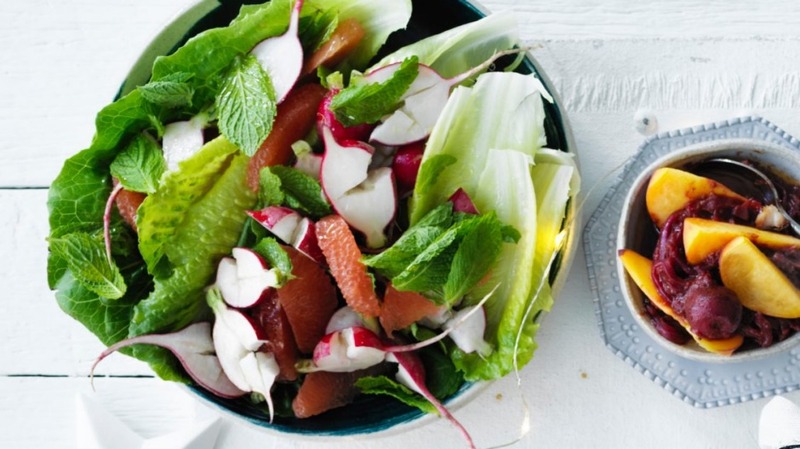 To serve, arrange the crushed radish and grapefruit segments on the salad.